The new TANDEMKROSS hat for shooting sports. The new [ T K ] trucker-style shooting hats are the perfect accessory for a long day at the range. Protect your face and eyes from sunlight and improve your vision for some weekend plinking or rimfire shooting sports. The hat features a charcoal gray front panel and solid black visor, with gray mesh back to keep you cool during a long day of shooting sports. 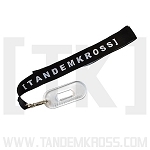 A TANDEMKROSS-branded Velcro band allows for custom fitting. The new #tandemized trucker hat is the perfect shooting accessory for any [ T K ] super fan and is available in two branding styles: a simple [ T K ] logo positioned on the right side of the hat and a square box logo positioned in the center of the hat. Both styles are a great way to show your [ T K ] pride at the range or at a rimfire competition! Loved the hat. It feels good, fits well. Unfortunately my dog ate most of it the second week I had it. I own both styles, like them both. If they wear out, I'll buy two more. Great Hat. Fits well even larger heads. Support your suppliers. this hat is sweet. it looks amazing. Fits great & the color scheme is nice. 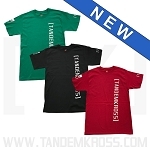 Pick one up to show off your [TK] Pride.